For sheer entertainment value, animal selfies pretty much always trump human ones. 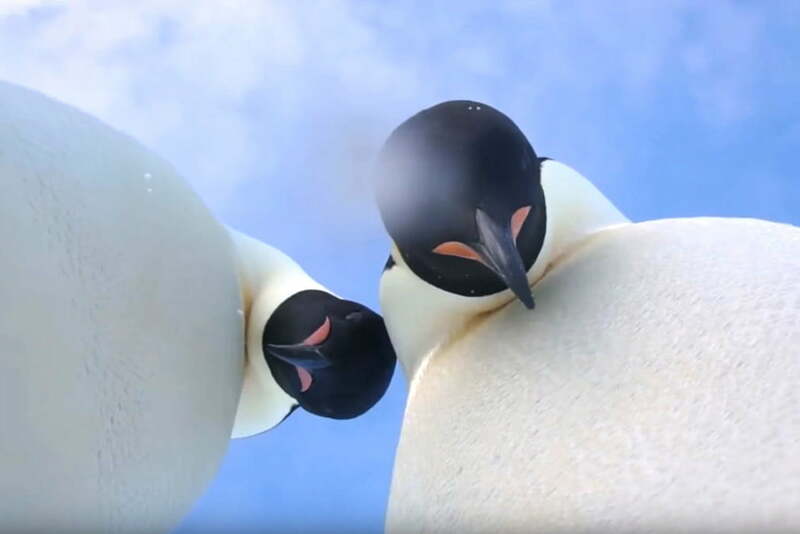 Case in point: A couple of curious penguins in Antarctica recently stumbled upon a camera placed on the ice by a member of the Australian Antarctic Division. Footage posted by the team shows the two penguins waddle up to the camera, knock it over, and then stare directly into the lens. As if weighing up the wisdom of placing a photographic device outside in freezing conditions, or perhaps passing judgment on the photographer’s choice of camera gear, or maybe even looking for the shutter button so they can take a proper selfie, the penguins give the kit a long hard look before glancing at each other and shaking their heads, apparently in utter disgust at what lay before them. The priceless clip, which has been getting plenty of attention on social media, was captured at the Auster Rookery near Australia’s Mawson research station, more than 3,000 miles southwest of Perth. The camera was set up by Australian Antarctic expedition member Eddie Gault, who recently visited the rookery. The adorable footage brings to mind other animal selfies, including that famous monkey picture that resulted in a lengthy copyright dispute. Less famous but arguably more impressive is this so-called “elfie” from 2015 when an elephant in Thailand grabbed a tourist’s camera before snapping a perfect selfie of the two of them, aided by its fully extended trunk. One for the album, certainly. Koalas at the Wild Life Sydney Zoo in Australia have also become adept at snapping selfies, while this eagle flew 70 miles with a camera before setting it down for its own, somewhat fuzzy, self-portrait. Where things get complicated is when humans try to get involved. Who can forget this grim incident in Argentina where beachgoers apparently passed around a baby dolphin so they could grab a selfie with it. The dolphin died. Then there was the story of a woman in Yellowstone Park who thought it would be a good idea to snap a selfie with a bison. She sustained injuries when the flustered creature flipped her into the air. Such incidents prompted the Forest Service to order people to stop taking bear selfies, while the National Oceanic and Atmosphere Administration has warned visitors to the New England coast not to take selfies with seals. Even Instagram, where most of the selfies end up, has urged users not to post such images, as they not only risk injury to the human, but can also cause distress to the animal.